Kite Surfing, also known as Kite Boarding, is an extreme water sport that involves surfing while using wind power as a propellant. This adventure sport combines windsurfing, surfing, paragliding, wakeboarding, and gymnastics to create a unique experience and is recommended for anyone who thrives on an adrenaline rush. The origin of Kite surfing can be attributed to the nineteenth century when George Pocock used large oversized kites to harness wind power and propel carts and boats with it. George was trying to find an alternative to horsepower in order to avoid the “horse tax” levied during that era. The method used by George is still in practice today and kite surfers continue to use a four-line control system. A hundred years later, in 1903, Samuel Cody, an aviation pioneer, developed “man-lifting kites” and crossed the English Channel in a kite-powered, small collapsible canvas boat. Today, kite surfing is a popular adventure sport enjoyed by people of all ages. Beaches with windy weather conditions are favoured for this sport and kite surfing championships are held around the world. Kitesurfing enthusiasts travel around the globe to attend such competitions. If you are travelling to Cape Town for a holiday, you can enjoy kitesurfing at Sunset Beach. Cape Town is world famous for its kitesurfing activities and potential. Sunset Beach happens to be one of the most scenic kite surfing spots around the globe, looking over the famous Table Mountain. Weather conditions at the Sunset Beach are a kite surfer’s dream, and every day, you can find a different level of kite surfing challenge at Sunset Beach. Many famous professional kite surfers come to Sunset Beach, Cape Town, to indulge in the unique experience it has to offer. Cape Town is different from most kite boarding spots around the world, due to the variety of weather conditions that prevail here. Waters from the warm Indian Ocean meet the cooler Atlantic Ocean currents at the Cape and the temperature difference creates strong, reliable winds that start early morning and continue to build up in speed as the day progresses, reaching over 30 knots by late afternoon. 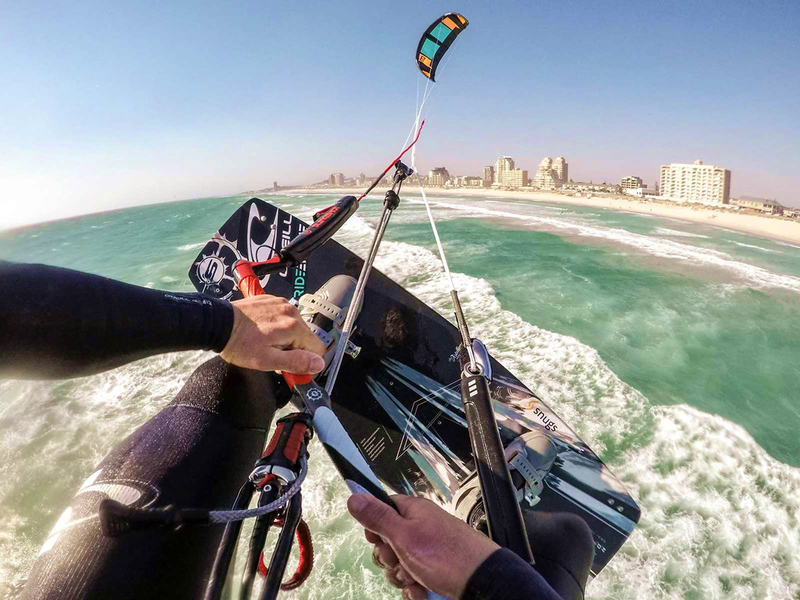 The famous Cape Doctor, (Cape Town’s characteristic strong southeastern wind) helps create ideal kite boarding conditions that lure kite surfing pros like Ruben Lenten and five-times kite surfing world champion Aaron Hadlow to Sunset Beach for training. Kitesurfing season begins from October and stays until April, and the wind strength ranges from medium to strong on most days. Cape Town has more than 30 kite surfing spots to offer, each with its own quality, challenge and stunning views. For beginners, there are opportunities that allow basic kite surfing training with smaller waves, while there are other days when the winds are strong, ranging 3-5 metres in height for the more experienced kite surfers. Moreover, the lagoons and river mouths around Capt Town offer flat water areas that are more suited to beginners looking to learn a few freestyle tricks. A kite surfing adventure is definitely recommended during your stay at Atlantic Breeze Guest House. Sunset Beach is just a few minutes’ walk from the guesthouse and you can easily sign up with one of the many kite surfing clubs and kite surfing schools here. The courses offered range from basic training to advance level kite surfing. Other services offered by these clubs include guided kitesurfing in the form of a group. Kite surfing is a great way of relaxing and enjoying yourself while in Cape Town. Free your soul and get away from the worries of your daily routine by challenging the wind and the waves. With the majestic Table Mountain as your witness, embark on an amazing adventure, and harness the sheer power of nature with a kite surfing holiday in Cape Town, South Africa. As the waves soar, so shall your spirit, and you will have an experience of a lifetime. Cape Town is an absolute treat for the golf lover.